How Astronomy contributed to the educational enlightenment of Glasgow, to its society and to its commerce. The words 'Astronomy' and 'Glasgow' seem an incongruous juxtaposition, and yet the two are closely linked over 500 years of history. This is a tale of enlightenment and scientific progress at both institutional and public levels. Combined with the ambitions of civic commerce, it is a story populated with noteworthy personalities and intense rivalries. It is remarkable to realise that the first Astronomy teaching in the Glasgow 'Colledge' presented an Earth-centred Universe, prior to the Copernican revolution of the mid sixteenth Century. Glasgow was later known astronomically for the telescope observations of sunspots made by Wilson in the 1760s, but less well known are the ideas related to mono-chromaticity within light, to dew point and hoar frost, and Herschel's discovery of infra-red energy in solar radiation by application of Glasgow-made thermometers. This engrossing and entertaining scientific history includes the story of Glasgow's 'Big Bang' of 1863, the controversy over 'Astronomer Royal for Scotland' and a historical survey of the eight observatories that once populated Glasgow. David Clarke brings us a complex weave of science and accompanying social history in this unique and fascinating work. 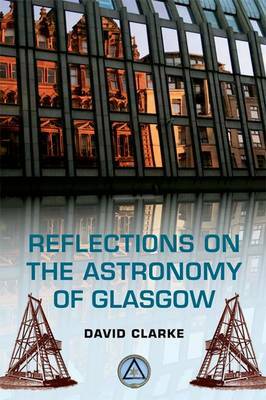 It is a comprehensive narrative of 500+ years of Glasgow's connections with Astronomy. Contributions made to Astronomy directly by Glasgow University, and new ideas developed there and picked up by others outside its walls are related. It provides short biographies of colourful contributors to the Astronomical scene in Glasgow. It presents the history, architecture and structures of eight Glasgow observatories. It gives insight on social aspects of Astronomy within Glasgow, its relationships with commerce, and the upsurge of interests in Astronomy by the general public.